Kiley said there’s no basis for him to even consider whether to delay enforcement on the law, much less decide its constitutionality. If nothing else, the judge noted that the challenge was filed only a day earlier. He said that means those defending the law — including both the attorney general’s office and Proposition 206 supporters — have not had a “fair opportunity” to respond to the allegations. Kiley did agree to consider the legal arguments in depth this coming Tuesday. Kiley rejected claims by challengers that leaving the law in place before the full-blown hearing on its legality will cause hardship for employers. Nothing in Friday’s action gives any hint on whether the judge believes the charges by the [Chamber] interests who sued that what voters approved is unconstitutional. But what is clear is that whoever loses in Kiley’s courtroom is virtually certain to ask the Arizona Supreme Court to overturn. That raises an interesting side issue. On Monday, the two new justices named by Gov. Doug Ducey, a foe of Proposition 206, are set to be sworn in. And expanding the court to seven could change the balance of political philosophies on the bench. So what you are suggesting is that these justices will make a partisan political decision, rather than to apply the law and make a legal decision? What you are saying is that Governor Ducey has politicized the state Supreme Court. We’ll have to wait to see if this corruption of the judiciary is true. Business interests, led by the state chamber, made a half-hearted effort to convince voters to reject the measure after chamber President Glenn Hamer conceded the popular measure was likely to pass. Proposition 206 was approved on a 58-42 margin. Now the organization, joined by local chambers and other business interests, hopes to quash the measure in court. Johnson says the Arizona Constitution says any ballot measure which requires the state to spend more money must also include a dedicated funding source, such as a new or increased tax. This measure has no such levy. The initiative has no direct costs as it specifically exempts the state from having to raise the pay of its own workers. But the Arizona Health Care Cost Containment System, the state’s Medicaid program, said this week it plans to increase what it pays private contractors who provide services for those with special needs, contractors who are now paying their employees less than $10. Johnson contends that is a mandated cost which requires Kiley to void the measure. But attorney Jim Barton said nothing in the measure requires the state to backfill the higher costs to the providers. And even if there were, he said the constitutional provision does not allow for the entire measure to be voided but only for the state to refuse to boost its reimbursement to the providers. Don Shooter, the Yuma Republican who will chair the House Appropriations Committee — and who earlier this year tried to gut the earlier 2006 Minimum Wage Act — conceded Friday he does not know whether there is a legal obligation on the state to finance the additional costs incurred by the providers, a figure estimated by AHCCCS at $11 million for the next six months. But he believes there is a “moral responsibility” to come up with the cash. Shooter also said he hopes the judge does enjoin the law from taking effect, but not because of the questions of the statute’s legality. He said the Legislature needs a few months to figure out how to either come up with the extra dollars or, possibly, ask voters at a special election if they are now having second thoughts given the additional costs to the state. Section 3. The legislature shall provide by law for an annual tax sufficient, with other sources of revenue, to defray the necessary ordinary expenses of the state for each fiscal year. And for the purpose of paying the state debt, if there be any, the legislature shall provide for levying an annual tax sufficient to pay the annual interest and the principal of such debt within twenty-five years from the final passage of the law creating the debt. Our Tea-Publican controlled legislature has been in violation of this constitutional provision for years. Just do your damn duty! Roughly $46.8 million in additional funding will be provided between January 1 and June 30, the end of the fiscal year, according to figures released Wednesday afternoon by the Arizona Health Care Cost Containment System, or AHCCCS. Those dollars will help cover some, but not all, of the cost of a higher minimum wage that must be implemented by care providers starting January 1 as mandated by the voter-approved Proposition 206. Rates that dictate how much it costs to provide services for Arizona’s vulnerable populations were adjusted to offset the costs of Prop. 206 and ensure that providers can stay open, according to Christina Corieri, a senior policy advisor to Gov. Doug Ducey. Roughly $20.3 million will cover new labor costs for providers for the elderly and physically disabled. Another $25.1 million will be provided to the Department of Economic Security, which distributes funds to private care providers for individuals with developmental disabilities. Another $1.4 million will cover labor costs for private care providers who, in special circumstances, contract directly with AHCCCS. Those funds are a mix of state and federal dollars, said Beth Kohler, deputy director at AHCCCS, with the federal government picking up about two-thirds of the cost. The state is on the hook for $11.1 million in funding, and Arizona counties will kick in about $3 million for services for the elderly and physically disabled, Kohler said. She said her agency’s share of the cost will be covered by existing funding available at AHCCCS. “We believe for the cost for this fiscal year covered that it can be through existing resources,” she said. DES has a small amount of money available to cover part of the $11.1 million, but Corieri said she expects the agency will have to ask state lawmakers for an emergency appropriation to fully cover its share. It’s time for our lawless Tea-Publicn legislature to step up and do it’s constitutional duty under the Arizona Constitution, Article 9, Section 3. That was a clever ploy so the voter could vote “yes” without feeling they might hurt their own pocketbook through increased to pay for government workers. It is so-o-o-o-o much easier to be generous with other peoples money…in this case all the business owners in the State. It will be interesting to see if you can find the originators of this initiative anywhere when the chickens come home to roost and an honest assessment of the impact shows how much the initiative hurt the people it was supposed to help. First of all, Arizona uses nonpartisan judicial merit selection commissions to investigate and evaluate applicants for judgeships. They present a bipartisan list to the governor by law. Secondly, Arizona has not had a Democratic governor since Janet Napolitano left office in February 2009, so your raving makes no sense. Finally, of the two individuals chosen by Governor Ducey, Andrew Gould,a judge from the Arizona Court of Appeals, has demonstrated no apparent political bias in his opinions from the bench of which I am aware. I am not familiar with John R. Lopez, who has been serving as an Arizona solicitor general. My point was to mock the reporter for assuming that Governor Ducey’s appointments will make partisan political decisions rather than follow the law and precedents. I do not assume that. But you are too blinded by your political partisanship and need to troll this site to understand that. This is also not about state employees, the claim is about nonprofit agencies that contract with the state to provide certain health and social services. Another point you miss in your blind partisanship. Oh, it is quite true that minimum wage will cause people to lose jobs. David Nuemark wrote a whole book sifting through hundreds of studies, determining which put in place proper controls. His conclusions from the empirical research exactly mirror microeconomic theory (surprise!?). 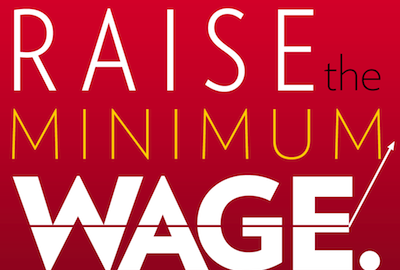 When you establish or increase minimum wage, employers 1) reduce employment and 2) shift those jobs away from the poor and minorities – both actions which reduce the incomes of the poor. The winners? The children of rich people. Neumark also establishes that this wreckage is all for almost no benefit. 85% of all minimum wage employees are not at minimum wage 3 years after starting employment. The fact that 600 economists are willing to swear that the truth is a lie tells us so very much about the economics profession at even the highest levels. I find it interesting, John, that people will ignore common sense when it comes to the minimum wage. If you think about it at all, the fact that minimum wage workers are becoming considerably more expensive would obviously mean employers would reduce their demoand for such workers. No commodity can increase drastically in price without a correspondeing reduction in demand. My Daughter tells me that dozens of companies, particulerly smaller businesses, are contacting us to inquire about Engineering Services to reduce the number of entry level employees they need. Whether it is through efficiency improvements or automation doesn’t matter, they just want to reduce the number of employees. Further she says we are getting dozens more inquiries from Engineering Companies that would like to subcontract with us for the same services to companies that are calling them. AzBM is a smart man, but it does show you how partisanship can blind a person even where common sense is concerned. “Finally, your perpetuation of the myth that increasing the minimum wage will cause people to lose their jobs is simply NOT TRUE. There is also evidence that it DOES hurt the economy, and more importantly the lives of the people it is suppose to help. This is a liberal blog, which I enjoy reading very much. But that also means that if I were try and post connections to some of these contrary opinion, those messages would be blocked…perhaps rightfully so since this is a liberal blog and not a forum for open discussion. There is no surprise there. In every issue like this, academia (too include Nobel Prize winners) can be depended upon to come out in favor of the liberal position. Their status in academia – to say say nothing about their funding – depends on them doing so. They don’t even have the opportunity to remain nuetral. When it comes to liberal issues like this, they either speak out in strong favor of it, or they are assumed to be against it. And they sure as heck don’t want to be against it with Professorships, Chairs, Status, Funding, etc., depending on the support of their peers.